Stevland Judkins (later changed to Stevland Morris) was born prematurely in Saginaw, Michigan. Common belief is that he became blind after being exposed to excessive oxygen levels in his incubator, but the oxygen saved his life. The actual cause was premature development of his eye, causing the blood vessels to detach from the retina. He learned to play a number of instruments, most notably the piano, congas, and harmonica, at an early age. In 1962, at the age of eleven, Morris was brought to Motown by Ronnie White of The Miracles, and Berry Gordy signed Morris to Motown's Tamla label as Little Stevie Wonder. At the age of 13, Little Stevie Wonder had his first major hit, "Fingertips (Pt. 2)", a 1963 single taken from a live recording of a Motortown Revue performance. The song, featuring Wonder on vocals, congas, and harmonica, and a young Marvin Gaye on drums, was a #1 hit on the US pop charts and launched him into the public consciousness. Dropping the "Little" from his moniker, Wonder went on to have a number of other hits during the mid-1960s, including "Uptight (Everything's Alright)", "With a Child's Heart", and "Blowin' In The Wind", a Bob Dylan cover which was one of the first songs to reflect Wonder's social consciousness. He also began to work in the Motown songwriting department, composing songs both for himself and his labelmates. By 1970, Wonder had scored more major hits, including "I Was Made To Love Her", "For Once In My Life", "My Cherie Amour", and "Signed, Sealed, Delivered (I'm Yours)". Besides being one of the first songs on which Wonder serves as both songwriter and producer, "Signed, Sealed, Delivered" is one of the main showcases for his backup group Wonderlove, a trio which included at various times Minnie Riperton, Deniece Williams, Lynda Laurence, and Syreeta Wright, whom Wonder married on September 14, 1970. Wonder and Wright divorced eighteen months later, but they continued to collaborate on musical projects. Besides Marvin Gaye, Stevie Wonder was one of the few Motown stars to contest the label's factory-like operation methods: artists, songwriters, and producers were usually kept in specialized collectives with little or no overlap, and artists had no creative control. Wonder argued with Berry Gordy over creative control a number of times. As a compromise, Motown released an album of under the name "Eivets Rednow" (Stevie Wonder backwards). Arguments continued and, Wonder allowed his Motown contract to expire, and he left the label on his twenty-first birthday in 1971. His final album before his departure was Where I'm Coming From, which Gordy had strongly fought against releasing. Wonder independently recorded and released two albums, which he used as a bargaining tool while negotiating with Motown. Eventually, the label agreed to his demands for full creative control and the rights to his own songs, and Wonder returned to Motown in March 1972 with Music of My Mind, an album which is considered a classic of the era. 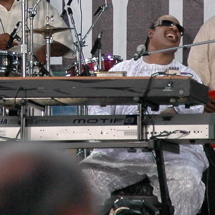 Unlike most previous artist LPs on Motown, which usually consisted of a collection of singles, b-sides, and covers, Music of My Mind was an actual LP, a full-length artistic statement, and began a string of five albums released over a period of less than five years, that make up what is generally considered Stevie Wonder's classic period. October 1972's Talking Book featured the #1 pop and R&B hit "Superstition", which is one of the most distinctive examples of the sound of the clavinet. Featuring a rocking groove that was partly inspired by and then covered by rock guitarist Jeff Beck, "Superstition" gained Wonder an additional audience on rock radio stations. That audience was further exposed to Wonder when he opened for The Rolling Stones on their much-heralded 1972 U.S. tour. Wonder's pop following was not neglected, however, as "You Are the Sunshine of My Life" followed to #1 on the pop charts and became a staple love song for decades to come. Between them the songs won three Grammy Awards. Wonder's critical and popular acclaim only increased less than a year later, in August 1973, when Wonder released what is often called his best album, Innervisions. Political considerations were brought into greater focus than ever before, with the driving, percolating "Higher Ground" (#4 on the pop charts) followed by the memorable "Living for the City" (#8), which found Wonder more evocatively describing a time and place in American life than he would anywhere else in his career. Popular ballads were also present, in a mixture of moods that nevertheless held together as a unified whole. The album generated three more Grammy Awards, including Album of the Year. On August 6, 1973, just days after the release of Innervisions, Wonder was in a serious automobile accident while on tour, when a log from a truck went through a passenger window and struck him in the head. This left him in a coma for a while and resulted in a permanent loss of his sense of smell. Despite the setback, Wonder eventually recovered all of his musical facilities, and reappeared in concert at Madison Square Garden in March 1974 in a performance that highlighted both up-tempo material and long, building improvisations on mid-tempo songs such as "Living for the City". The album Fulfillingness' First Finale then appeared in July 1974 with a more personal, introspective outlook, but nevertheless sent two hits high on the pop charts. The Album of the Year was again one of three Grammys won. Wonder then focused his attentions on what he intended as his magnum opus, the double album-with-extra-EP Songs in the Key of Life, released in September 1976. Sprawling in style, unlimited in ambition, and sometimes lyrically difficult to fathom, the album was hard for some listeners to fully assimilate. Two tracks fairly jumped out of the radio with energy, however, becoming the #1 hits "I Wish" and "Sir Duke". "Isn't She Lovely" was a future wedding and bat mitzvah fixture, while songs such as "Love's in Need of Love Today" (which years later Wonder would perform at the post-September 11 America: A Tribute to Heroes telethon) and the classical "Village Ghetto Land" reflected a far more pensive mood. Yet again Wonder was awarded Album of the Year, along with two other Grammys. Possibly exhausted by this concentrated and sustained level of creativity, Wonder was not heard from again for three years. Nevertheless his output during this stretch had left its mark: the 1983 Rolling Stone Record Guide said that these albums "pioneered stylistic approaches that helped to determine the shape of pop music for the next decade," while in 2005 Kanye West said of his own work, "I'm not trying to compete with what's out there now. I'm really trying to compete with Innervisions and Songs in the Key of Life. It sounds musically blasphemous to say something like that, but why not set that as your bar?" When Wonder did return, it was with a soundtrack album for the never-finished film Journey Through the Secret Life of Plants (1979). Mostly instrumental, the album was panned at the time of its release but has come to be regarded by some critics as an unusual classic. Hotter Than July (1980) became Wonder's first platinum selling album, and its single "Happy Birthday" was a successful vehicle for his campaign to establish Dr. Martin Luther King's birthday as a national holiday. The album also included "Master Blaster (Jammin')", his tribute to Bob Marley, and the sentimental ballad, "Lately", which was later covered by 1990s R&B act Jodeci. In 1982, Wonder released a retrospective of his '70s work with Original Musiquarium and included three more hit singles in his catalogue, including the ten-minute funk classic "Do I Do" (which included legendary jazz trumpeter Dizzy Gillespie), "That Girl" (one of the year's biggest singles to chart on the R&B side) and "Ribbon in the Sky", one of his many classic compositions. Wonder also gained a #1 hit that year in collaboration with Paul McCartney in their paean to racial harmony, "Ebony and Ivory". 1984 saw the release of Wonder's soundtrack album for The Woman in Red. The lead single, "I Just Called to Say I Love You", was a #1 pop and R&B hit in the US; it is Motown's biggest-selling single ever in the United Kingdom. It was placed 13th in the all-time list of best-selling singles in the UK issued in 2002, and it won an Academy Award for "Best Song" in 1985. The following year's In Square Circle featured the #1 pop hit "Part-Time Lover". By 1985 Stevie Wonder was an American icon, the subject of good-humored jokes about blindness and affectionately impersonated by Eddie Murphy on Saturday Night Live. Thus it was only natural that he was in a featured duet with Bruce Springsteen on the all-star charity single for African famine relief, "We Are the World", and that he was part of another charity single the following year, the AIDS-targeted "That's What Friends Are For". After 1987's Characters LP, Wonder continued to release new material, albeit at a slower pace. He recorded a soundtrack album for Spike Lee's film Jungle Fever in 1991, and released both Conversation Peace and the live album Natural Wonder during the same decade. In December 1999, Wonder announced that he was interested in pursuing an intraocular retinal prosthesis to partially restore his sight. Wonder's first new album in ten years, A Time To Love, was released on October 18, 2005, after having been pushed back from first a May, and then a June release. The album was released electronically on September 27, 2005, exclusively on Apple's iTunes Music Store; see External links below. The first single, "So What the Fuss", was released in April and features Prince on guitar and background vocals from En Vogue. A second single, "From the Bottom of My Heart" is a current hit on adult-contemporary R&B radio. The album also features a duet with India Arie on the title track "A Time To Love". Wonder performed at the pre-game show for Super Bowl XL in Detroit in early 2006, singing various hit singles (with his four-year-old son on drums) and accompanying Aretha Franklin during "The Star Spangled Banner". In March 2006, Wonder received new national exposure on the top-rated American Idol television program. Each of 12 contestants were required to sing one of his songs, after having met and received guidance from him. (Some of the contestants idolized Wonder, while others showed little familiarity with his work.) Wonder also performed "My Love Is On Fire" live on the show itself. Besides creating his own material, Stevie Wonder has written and produced a number of songs for other artists. Among his most significant compositions or co-compositions are "The Tears of a Clown" by Smokey Robinson & The Miracles, "It's a Shame" by The Spinners, " "I Can't Help It" by Michael Jackson, and "You Are My Heaven" by Roberta Flack & Donny Hathaway. He has also collaborated with Quincy Jones, Barbra Streisand, Kenneth "Babyface" Edmonds, B.B. King, The Supremes, The Temptations, Dionne Warwick, Julio Iglesias, and former Musical Youth lead singer Dennis Seaton. Stevie Wonder's success as a socially conscious musical performer was significantly influential to both R&B and pop music. Among the musicians and performers who list Wonder as one of their major influences are Mariah Carey, Mary J. Blige, Kanye West, George Michael, Nik Kershaw, India.Arie, Musiq Soulchild, Alicia Keys, John Legend, Jay Kay, Donell Jones and the members of Jodeci, Maroon 5, and Dru Hill. Stevie Wonder's songs are renowned for being hard and demanding to sing. There are many 9ths, 11ths and 13ths chords. The melody of the song is hard to predict with big leaps. The are many abrupt modulations. His songs are melismatic - a syllable of a word is sung over different notes. Such qualities allow only skilled singers to show the skills - a noted example are in the American Idol Hollywood Performances, where judge Randy Jackson has repeatedly stated the difficulty of Wonder's songs. Stevie has received 24 Grammy Awards and one Academy Award over the course of his career. In 1989, Wonder was inducted to the Rock and Roll Hall of Fame. He is also an inductee to the Songwriters Hall of Fame. Wonder also received Kennedy Center Honors in 1999, and was awarded the highest honor to be received at the Billboard Music Award for the Century Award in 2004. Wonder has seven children. His last child, Mandla Kadjay Carl Steveland Morris, was born on May 13, 2005, and is the second child of Wonder and his current wife, Kai Milla Morris. He is an active supporter of the Democratic Party. Stevie Wonder (born May 13, 1950 as Stevland Judkins, later changed to Stevland Morris) is an American singer, songwriter, producer, musician, humanitarian and social activist. Wonder has recorded more than 30 Top 10 hits, won 24 Grammy Awards (a record for a living artist), also one for lifetime achievement, and been inducted into both the Rock and Roll and Songwriters halls of fame. Blind from infancy, Wonder has become one of the most successful and well-known artists on the Motown label, with nine U.S. #1 hits to his name and album sales totaling more than 100 million units. He has recorded several critically acclaimed albums and hit singles, and writes and produces songs for many of his labelmates and outside artists as well. A multi-instrumentalist, Wonder plays the drums, bass guitar, congas, and most famously the piano, harmonica and keyboards. Many critics refer to the quality of his work and its versatility as being indicative of musical genius. Check Stevie Wonder tickets here.